There is a difference in roles of men and women. Always has been and always will be. There is an equality in our relationship to God. It is the man who speaks and makes a theological comment upon the woman’s creation, not vice versa (2:23). When God created the human race, He placed the man squarely in the center of His creative work. The other activities recorded in Genesis 2 are all relative to the man’s existence, nature, and needs. This includes the creation of the woman. All of this strongly implies that the man is the one to take the lead in the commands given by God to subdue the earth. The female’s being derived from the male does not necessarily, in and of itself, confer headship upon the male. We would not know that this is an indicator of male headship except for the revelation of the Spirit in 1 Corinthians 11:3-8. In His decision to bring woman into existence out of the man, God established an appropriate and everlasting symbol of his intention for man to exercise headship over the woman and for the woman to exist in a relationship of dependence upon the man. Feminist Argument: God is called man’s helper 16x. (Same word, "ezer" is used). The Bible does not reveal Satan’s motive for beginning with Eve. It just records the fact that Eve was the first to be tempted and deceived, and the first to sin. We are not told whether it was part of a deliberate strategy of Satan, or if his choice was just random. But the fact that we do not know for sure why Satan chose Eve does not negate the force of 1 Timothy 2:14, which says that Eve’s being the one who was deceived does have something to do with women’s being prohibited from teaching men and having authority over men in the New Testament church. It is possible that there is something inherent in women’s nature that somehow makes them more vulnerable to deception concerning spiritual matters and therefore less qualified to teach men and have authority over men in the context of the church. This would be consistent with Peter’s description of woman as the "weaker vessel" (1 Peter 3:7). Peter does not explain the nature of this "weakness," nor does he suggest that it constitutes some kind of flaw or fault in women. Whatever it is, it would be consistent with the role for which God created woman in the first place. That is to say, the characteristics that make a woman more strongly suited for her intended role in the family and church make her weaker with reference to what is required for duties of headship and leadership. Such characteristics probably have to do more with her emotional rather than her intellectual nature. One other point must be noted concerning the sin itself, namely, the connection between Adam’s responsibility for that sin and the fact of the male headship that was already established in Genesis 2. Both the Genesis context and Biblical teaching as a whole seem to point to the fact that Adam, the male, bears a greater responsibility for the first sin than Eve. This is exactly what we would expect if Adam was already the appointed head of that two-member family. God didn’t call both of them together, but he called the head. As the God-appointed head, Adam bore the primary responsibility for their actions. Adam held the position of being responsible for sin entering the human race even though Eve sinned first. But the free gift is not like the transgression. For if by the transgression of the one the many died, much more did the grace of God and the gift by the grace of the one Man, Jesus Christ, abound to the many. And the gift is not like that which came through the one who sinned; for on the one hand the judgment arose from one transgression resulting in condemnation, but on the other hand the free gift arose from many transgressions resulting in justification. For if by the transgression of the one, death reigned through the one, much more those who receive the abundance of grace and of the gift of righteousness will reign in life through the One, Jesus Christ. So then as through one transgression there resulted condemnation to all men, even so through one act of righteousness there resulted justification of life to all men. For as through the one man’s disobedience the many were made sinners, even so through the obedience of the One the many will be made righteous. Why is such responsibility laid on Adam? The only thing that can explain the clear teaching concerning Adam’s greater responsibility is his immediate headship over Eve and his ultimate and representative headship over the entire human race. Marriage Is Not In The Context of 1st Timothy 2:8-15! The N.T. teaches a difference in the roles of men and women. The differences of roles are based on God’s choice of creation. God chose to make men and women different and they have different responsibilities as they work together to serve God. Feminism has been one of the most successful social movements in our nation. Although there have been some legitimate goals, one of the results of this movement is to influence our culture to ignore the fact that there is a difference in the roles of men and women. After their views became more accepted, others have tried to interpret the Bible to fit their views. God likens rebellion to witchcraft in 1st Samuel 15:23. 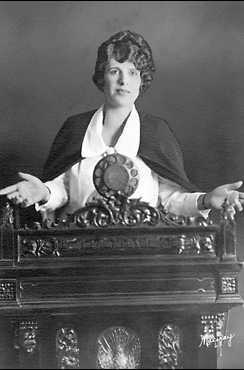 Women who enter the pulpit are disobeying God, openly and shamelessly, which puts them in the same boat as demonic witches.